Misdirection of bur in attempting to gain access to the pulp chamber. During the placement of posts and pins. Failure to follow the apical curvature during root canal instrumentation. The purpose of this study was to evaluate the effect of calcium sulfate and hydroxylapatite when used as an internal matrix on the sealing ability of resin modified glass ionomer material to repair furcation perforation. To evaluate the effect of calcium sulfate and hydroxylapatite matrix on the sealing ability of a resin modified glass ionomer material to repair the furcation perforation. 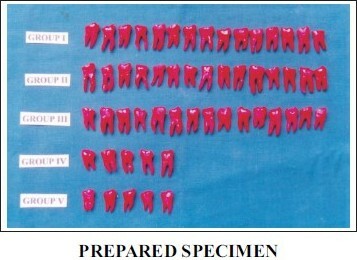 The study samples comprised of 55 recently extracted mandibular molars with nonfused well developed roots. These teeth were cleaned by placing them in a 5% solution of sodium hypochlorite for 15 minutes and then were washed with tap water. Out of the 55 teeth, 45 teeth were randomly divided into 3 groups of 15 teeth each. The remaining 10 teeth were randomly divided into 2 groups of 5 teeth each. The following were the groups along with types of restoration. Group I: Furcation perforation repaired with resin modified glass ionomer cement only. Group II: Furcation perforation repaired with medical grade calcium sulphate as an internal matrix and resin modified glass ionomer cement over it. Group III: Furcation perforations repaired with hydroxylapatite as internal matrix and resin modified glass ionomer cement over it. 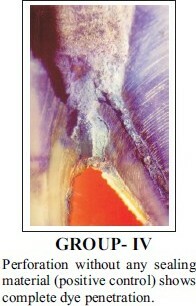 Group IV: These teeth served as positive controls. The teeth were prepared in the same manner as the experimental groups but received no filling. 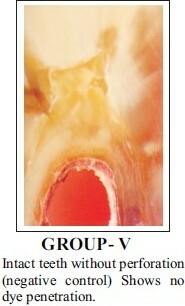 Group V: These intact teeth with out perforation served as negative controls. Access openings were prepared using a#4 round bur in a high speed handpiece with water coolant in the experimental group of 45 teeth. Perforations were made in the pulp chamber floor using a #2 round bur in a low speed handpiece. Teeth were rinsed with water and dried with oil-free air. A moist cotton pellet was placed between roots in the furcation area, and the teeth were kept in an incubator at 37º C for 24 hours. The perforations in the specimens of Group I were repaired with a resin modified glass ionomer only. This material was mixed according to manufacturer's instructions. The material was allowed to flow apically into the perforations and cured when it had sealed the apical end of the defect. Two additional incremental layers were applied and light cured. The perforations in the group II were repaired with medical grade calcium sulfate as an internal matrix under glass ionomer cement. Calcium sulfate powder was placed into the moist perforation with amalgam carrier. Successive amount of powder was added until the moisture present from the cotton pellet was saturated with powder. Calcium sulfate was then condensed with a finger plugger. After the setting of calcium sulfate, dentin surface was prepared using a #33 bur to make a small cavity within the calcium sulfate floor. This small cavity was cleaned with water spray and dried with oil-free air. The resin modified glass ionomer was then applied into the perforation as in Group I. 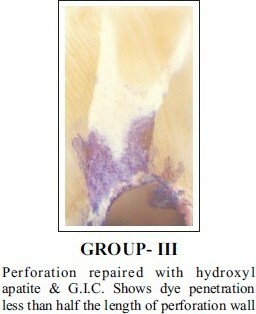 The perforation defects in specimens of Group III were repaired using hydroxylapatite as an internal matrix under glass ionomer cement. Hydroxylapatite was mixed in a sterile plastic well and placed into the perforation with a plastic instrument and condensed with a finger plugger. After setting of hydroxylapatite, dentin surface was prepared using a #33 bur to make a small cavity within hydroxylapatite floor. The cavity was cleaned with water spray and dried with oil free air, followed by application of the resin modified glass ionomer over the hydroxylapatite matrix in the same manner as in group l.
Experimental teeth were handled directly after removal from the incubator and the canal orifice was protected by insertion of a suitable size file into the canal during perforation repair. The pulp chamber and access preparations of experimental teeth were filled with composite resin. All teeth were painted with nail polish except near the perforation in the furcation area and then submerged in 2% methylene blue dye for 2 weeks at room temperature. After removal from the dye, the teeth were washed thoroughly in tap water and sectioned through the repaired perforation parallel to the long axis of the tooth, with diamond disc. Sections were examined under stereomicroscope to evaluate dye penetration. Every sample was measured for linear dye leakage. Length of perforation was measured from the pulp chamber floor to the apical end of the perforation. Leakage was measured from the apical level of repair material to the coronal end of the perforation walls. The length of repair material was measured from the floor of the pulp chamber to the coronal end of the matrix material. 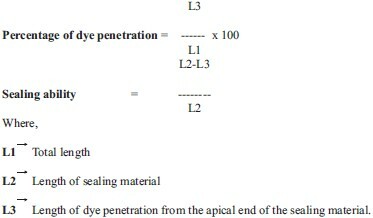 Percentages of dye penetration in relation to the occupied walls and sealing ability of the materials were calculated by using the following mentioned formulae. One way ANOVA revealed that different groups exhibited different dye penetration (F:6.86, P<0.01) and different sealing ability (F:33.6, P<0.01). In order to assess which group differs significantly from others, Duncan's Multiple Range Test was used. Furcation perforation repaired with resin modified glass ionomer cement showed maximum microleakage (mean 60.87%) and minimum sealing ability when compared to other two groups. This value was significantly higher (P<0.0l) than that of furcation perforation repaired with calcium sulfate and resin modified glass ionomer cement. It is also significantly higher (P<0.0l) than that of furcation perforation repaired with hydroxylapatite and resin modified glass ionomer cement. Furcation perforation repaired with calcium sulfate and resin modified glass ionomer cement showed less microleakage (mean 32.85%) and more sealing ability when compared to furcation perforations repaired with resin modified glass ionomer cement only. And this value was significantly higher (P<0.01). But it showed more microleakage and less sealing ability when compared to furcation perforation repaired with hydroxylaptite and resin modified glass ionomer cement. This value was not significant statistically. Furcation perforation repaired with hydroxylapatite and resin modified glass ionomer cement showed minimum microleakage and maximum sealing ability when compared to other two groups. This value was significantly higher (P<0.01) than that of furcation perforation repaired with resin-modified glass ionomer only, but it is not significant when compared to furcation perforation repaired with calcium sulfate and resin modified glass ionomer cement. A root perforation can be defined as, "An artificial opening in a tooth or its root created by boring, cutting or pathological resorption which results in communication between the root canal and periodontal tissues". The most common cause of root perforation is procedural accident which can occur as a result of misdirected bur during access preparation or during preparation of a post space. In addition excessive flaring of cervical portion of curved roots in molars can also cause lateral root perforations. Endodontic perforation definitely effects the outcome of the treatment and thus the prognosis of the tooth. Various surgical and non-surgical means have been proposed to treat the defect. Although root perforations may be repaired surgically, it often leads to: Loss of attachment, Chronic pocket formation and Periodontal furcation involvement. The major difficulty with non-surgical repair even in case of proper seal is the extrusion of filling material into the periodontal ligament space that might interfere with periodontal ligament reattachment. Reattachment to materials like amalgam, gutta percha, or calcium hydroxide does not occur. The concept of internal matrices was developed in an attempt to control the extrusion of filling material into the periodontal ligament space. The matrix was suggested for use under repair materials such as glass ionomer cement to prevent their extrusion. However the effect of this matrix on sealing ability of glass ionomer cement is yet to be known. Because the matrix material cannot be removed after placement, it must satisfy the criteria for an implant material. It must be biocompatible and should not produce an inflammatory response. It must be sterile or capable of being sterilized, able to be manipulated within the root canal system and also stimulate bone formation. Materials available in dentistry that offer these properties are freeze dried bone, demineralized bone and calcium phosphate materials like tricalcium phosphate and hydroxylapatite. The medical grade calcium sulfate commonly known as Plaster of Paris has been suggested for the treatment of root perforations. It is a safe, absorbable, moldable material that is easy to handle and less expensive. It aids in guided tissue regeneration and excludes epithelial tissues from the sites of bone formation. It also has been advocated and shown to allow bone regeneration in clinical trials. It is readily available and easily sterilizable. Plaster of Paris proved to provide a good barrier against extrusion of the repair materials when it was used to repair furcation perforations in vitro. Andeeman indicated that Plaster of Paris when placed in periodontal ligament defects was able to regenerate new alveolar bone. These properties have prompted the study of Plaster of Paris as a repair material for the periodontal ligament defect of furcation perforation. Hydroxylapatite, chemically Ca 10 (P04) 6 (OH) 2 has been researched extensively for use in oral surgery and periodontal procedures. It has also been described as a biological internal matrix to control the extrusion of the filling material into the periodontal ligament area and was found to be biocompatible, nontoxic and osteoconductive. It has also been used as coatings for implants and bone grafting. The material has a crystalline physical texture similar to sand. The physical and chemical properties are similar to enamel and bone. Recently MTA is also tried as a matrix material to create a artificial floor which requires further research. 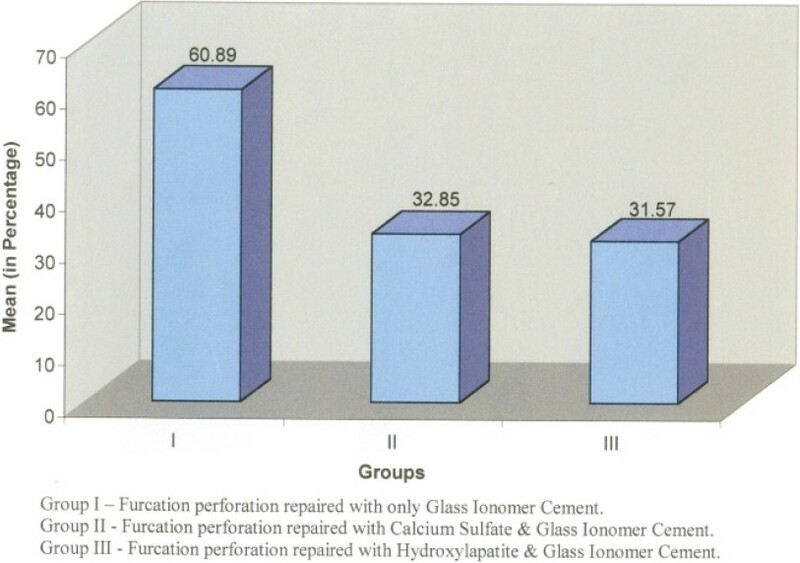 In this study the Group I where light cured glass ionomer cement was used to repair the furcation perforation without any matrix showed highest degree of dye penetration, when compared to Group II and Group III where perforations were repaired with light cured G.I.C. over calcium sulfate and hydroxylapatite as an internal matrix respectively. The difference was statistically significant (P<0.05) in both the cases. This result is in agreement with study done by Hatem A.Alhadainy (1998). 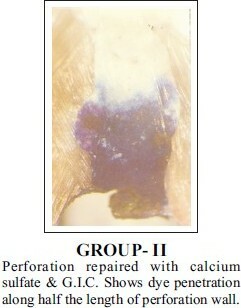 In his study furcation perforations were repaired using only vitrebond, calcium sulfate and vitrebond, hydroxyapatite and vitrebond as sealing materials. The probable causes for more dye penetration when glass ionomer cement was used alone without matrix could be as follows. 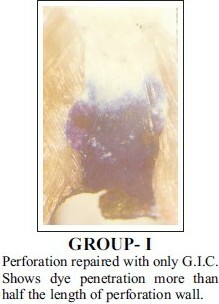 Among Group II (Calcium sulfate) and Group III (Hydroxylapatite) where perforations were repaired with light cured glass ionomer cement with matrix of calcium sulfate and hydroxylapatite respectively, Group II showed more dye penetration when compared to Group III specimens. However, the difference was not statistically significant. The presence of Plaster of Paris debris on the tooth surface may adversely affect the adhesion of glass ionomer cement to the tooth surface which inturn may attribute to more microleakage ,,. Flow of restorative material is a critical factor in reducing the microleakage around a furcation perforation. Plaster of Paris debris may effect the flow of light cured glass ionomer material  . 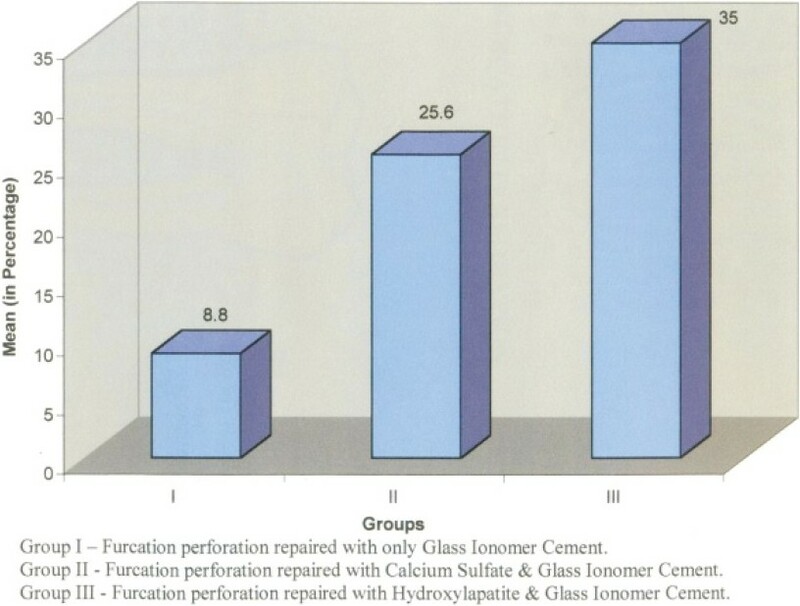 In 1998 Hatem A.Alhadainy and Van T.Himel  conducted in vivo study to evaluate hydroxylapatite based material and calcium sulfate where each was used under a resin modified glass ionomer cement to repair furcation perforations, the results showed highest radiographic success with hydroxylapatite based material, this was followed by calcium sulfate and glass ionomer. The Group V specimens (negative control) i.e. specimens without perforation showed no microleakage while Group IV (positive control), where in the perforations were not sealed (Group IV) showed maximum microleakage. These findings are in agreement with other studies conducted by Hatem A.Alhadainy et al  in 1998 and Manu Mittal et al  in 1999. In their studies specimen without perforation (negative control) showed no microleakage whereas specimens (positive control) where in perforations were not sealed showed maximum microleakage. This in vitro study demonstrates more microleakage in specimens where the perforations were repaired only with glass ionomer cement without matrix material than specimens where the perforations were repaired with calcium sulfate and hydroxylapatite as a matrix below glass ionomer cement. However, this study being an in vitro study did not simulate the oral environment. The oral conditions especially the contamination of the site while repairing perforations are different. Other conditions like periodontal status, gingival condition and oral hygiene may also affect the results. Therefore the results obtained from this in vitro study may differ, so further long term clinical studies should be conducted to evaluate the efficacy of the sealing materials. The microleakage was least when perforation was repaired with resin modified glass ionomer cement over hydroxylapatite used as an internal matrix. The microleakage was maximum when perforations were repaired with resin modified glass ionomer cement without any matrix material. Perforation repaired with resin modified glass ionomer cement over calcium sulfate as an internal matrix material showed more microleakage than the hydroxylapatite as an internal matrix. However, the difference was not statistically significant. Long term in vivo studies are required before these materials can be recommended for use as perforation repair material. 1. Mahmoud E.EIDeeb, Abbas Tabjbi, James R.Jensen: An evaluation of the use of amalgam, cavit and calcium hydroxide in the repair of furcation perforation. Journal of Endodontics, 1982 ; 10 (8): 459- 466. 2. Fuss Z., Trope M.: Root perforations: Classification and treatment choices based on prognostic factors. Endodontics and Dental Traumatology, 1996 ; 12 : 255-264. 3. Imura N., Mie Otani S., Hata G., Toda T. and Zuolo MX. : Sealing ability of composite resin placed over calcium hydroxide and calcium sulfate plugs in the repair of furcation perforations in mandibular molars. A study in vitro. International Endodontic Journal, 1998; 31: 79-84. 4. Eleftheria Pissiotis and Larz S.W.Spangberg: Biological evaluation of collagen gels containing calcium hydroxide and hydroxyapatite. Journal of Endodontics, 1990 ; 16 (10) : 468-473. 5. Hatem A.Alhadiny and Van T.HimeI: An in vitro evaluation of plaster of Paris barriers used under amalgam and glass ionomer to repair furcation perforations. Journal of Endodontics, 1994 ; 20 (9) : 449-452. 6. Wilson A.D.,McLean J.W. : Glass Ionomer Cement. Quintessence Publishing Co.,Inc,1988. 7. Hatem A.Alhadainy and AH A.Abdalla: Artificial floor technique used for the repair of furcation perforations: A microleakage study. Journal of Endodontics, 1998 :24 (1): 33-35. 8. Manu Mittal, Satish Chandra, Shaleen Chandra: An evaluation of Plaster of Paris Barriers used under various materials to repair furcation perforations. (In vitro study). Journal of Endodotnics, 1999 ; 25(5): 385-388. 9. Van T.Himel, Hatem A.Afhadainy: Effect of dentin preparation and acid etching on the sealing ability of glass ionomer and composite resin when used to repair furcation perforations over Plaster of Paris barriers. Journal of Endodontics, 1995; 21 (3): 142-144. 10. Donald E.Arens, Mahmoud Torabinejad: Repair of furcal perforations with mineral trioxides aggregate. Oral Surg Oral Med Oral Pathol Oral Radiol Endod, 1996; 82 : 84-88. 11. Hatem A.Alhadainy, Yehia M.Elbaghady: Use of a hydroxylapatite based material and calcium sulfate as artificial floors to repair furcal perforations. Oral Surg Oral Med Oral pathol. Oral Radiol Endod, 1998; 86 :6 :723-729. 12. Van T.Himel, Jim Brady and Jim Weir: Evaluation of repair of mechanical perforations of the pulp chamber floor using biodegradable Tricalcium phosphate or calcium hydroxide. Journal of Endodontics, 1985; 11 (4): 161-165. 14. Bogaerts P.: Treatment of root perforations with calcium hydroxide and super EBA cement: A clinical report International Endodontic Journal, 1997 ; 30 : 210-219. 15. Eric B.Bryan, G.WoolIard, William CMitchell: Non-surgical repair of furcal perforations : A Literature Reivew. General Dentistry, 1999 ; 47 (3) : 274-278. 16. Gabriele Pecora, Sebastiano Andreana,Joseph E.Margarone et al : Bone regeneration with a calcium sulfate barrier. Oral Surg Oral Med Oral Pathol Oral Radiol Endod, 1997; 84 :424-429. 17. Gary R.HartweIl and Marshall C.: Healing of furcation perforations in primate teeth after repair with decalcified freeze-dried bone : A longitudinal study. Journal of Endodontics, 1993 ; 19 (7): 357-361. 18. Hatem A. Alhadainy and Van T. Himel: Comparison of light cured materials versus chemically cured in the repair of furcation perforation. Oral Surgery Oral Medicine, Oral Pathology, 1993 ; 76 (3): 338-42. 19. Hatem A.Alhadainy and Van T.Himel: Evaluation of the sealing ability of amalgam, cavit, and glass ionomer cement in the repair of furcation perforation. Oral Surg Oral Med Oral Pathol, 1993 ; 75 :362-366. 20. Hatem A.Alhadainy: Root perforations. Oral Surg Oral Med Oral Pathol, 1994 ; 78 : 368-374. 21. Henry Harbert: Generic tricalcium phosphate plugs. An adjunct in Endodontics. Journal of Endodontics, 1991 ; 17 (3) : 131-134. 22. James B.Roane and Fred W.Benenati: Successful management of a perforated mandibular molar using amalgam and hydroxyapatite. Journal of Endodontics, 1987; 13 (8): 400-404. 23. James Y.M.Chau, Jeffrey W.Hutter, Thomas O.Mark, Brian ICWicall: An in vitro study of furcation perforation repair using calcium phosphate cement. Journal of Endodontics, 1997; 23 (9) : 588-592. 24. Jeeraphat Jantarat, Stuart G.Diashper, Harold H.Messes: Effect of matrix placement on furcation perforation repair. Journal of Endodontics, 1999 ; 25 (3) : 192-196. 25. Lisa D.Duggins,Jamie RXlay, Val T.Himel, John W.Dear: A combined endodontic retrofill and periodontal guided tissue regeneration technique for the repair of molar endodontic furcation perforations : Report of a Case. Quintessence International, 1994 ; 25 (2): 109-114. 26. Luke G.Maloney, Sophie A.Feik, Graham Ellender: Sealing ability of three materials used to repair lateral root perforations. Journal of Endodontics, 1993 ; 19 (2): 59-62. 27. Nakata T.T., Bae K.S., Baumagartner J.C.:Perforation repair comparing mineral trioxide aggregate and amalgam using an anaerobic bacterial leakage model. Journal of Endodontics, 1998; 24 (3) : 184-186. 28. Ramon Aguirre, Mahmoud E.ElDeeb and Mohamed E.ElDeeb: Evaluation of the repair of mechanical furcation perforations using amalgam, gutta percha or Indium foil. Journal of Endodontics, 1986; 12 (6) : 249-256. 29. Robert Balla, Carmine JXoMonaco, Joseh Skribner, Louis M.Lin: Histological study of furcation perforations treated with tricalcium phosphate, hydroxylapatite, amalgam and life. Journal of Endodontics, 1991; 17 (5) :234-238. 30. Ronald R. Lemon: Non-surgical repair of perforation defects. Dental Clinics of North America, 1992; 36(2): 441-457. 31. Salman M.A., Quinn F., Dermody J., Hussey D. et al: Histological evaluation of repair using a bioresorbable membrane beneath a resinmodified glass ionomer after mechanical furcation perforation in Dog's teeth. Journal of Endodontics, 1999; 25(3): 181-186.